Recently, horse racing lost a hero when The Barking Shark succumbed to colic. Not a superstar or household name like American Pharoah or California Chrome, but a hero nonetheless. The kind of horse that’s heart took him farther than his breeding and conformation should have ever taken him. The kind of horse that loved to run fast – as fast as he could for as far as he could. In doing so in the late 1990s and early 2000s, The Barking Shark racked up what was then a very substantial career earnings of $572,366 while often racing against many of the best horses of his era. The Barking Shark was born on April 7, 1993 in Kentucky. He hailed from humble roots, sired by multiple graded stakes-placed Naevus (a son of Mr. Prospector) and produced by an unraced Vice Regent mare, Sweet Augusta. Jayeff “B” Stables was likely hoping for a useful horse from the mating, but it is doubtful that they dreamed they would get a stakes-winning multiple Grade One stakes-placed runner that would defeat a Belmont Stakes (Gr. I) winner. 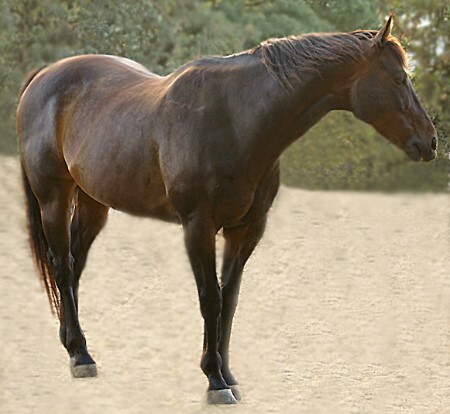 The Barking Shark failed to meet a $9,000 reserve in the 1994 Arizona Thoroughbred Breeders Association Fall Mixed Sale, but he was eventually sold for $12,000 at the 1994 Keeneland September Yearling Sale. Once in training, The Barking Shark flashed potential and collected his first stakes victory at two, dashing to an easy front-running victory in the $38,000 Ruidoso Horse Sales Thoroughbred Futurity at Sunland Park. It was at three that The Barking Shark really started to show his ability to outrun expectations. And he continued the pattern he would maintain for much of his career, which would see him vie for the lead in every race, rarely running further back than second place after the first half-mile of any contest. The question always was, on any given day, how fast and how far could he go? There were days that the answer far exceeded reasonable expectations. On February 5, 1996, The Barking Shark raced to an impressive four-length triumph in the $12,000 Old Line Policy Stakes at Turf Paradise. He followed that stakes win up with a fifth-place finish in the Arizona Derby, where he was only beaten two lengths. On May 15, 1996, The Barking Shark made his foray into turf racing and the more challenging competition in California, finishing an encouraging third, beaten 2 Â¼ lengths, in a 5 1/2-furlong claiming race at Hollywood Park. It was enough to prove he belonged among the top tier talent in Southern California, and people were beginning to see some real promise in the three-year-old gelding. After another solid but unspectacular effort in a high-level claiming race at Hollywood Park, trainer Robert Meyer decided to try The Barking Shark in stakes company, entering him in the Playa Del Ray Handicap. After battling between horses for the early lead, The Barking Shark tired to finish fifth, beaten seven lengths. With that finish, Meyer and Henderson Stables decided to drop the gelding back in for a claiming tag in his next start, a 5 1/2-furlong turf race on July 6. Trainer Marcelo Polanco, acting on behalf of 5C Racing Stable, LLC, saw enough in The Barking Shark that he seized the opportunity and claimed the speedy gelding for $50,000 out of his third-place finish that claiming race. Under Polanco’s training, The Barking Shark really started to roll. He took to the Del Mar turf course beautifully, climbing the class ladder with surprising ease. In his first start for Polanco, The Barking Shark flew to a long early lead in the one mile $80,825 Oceanside Stakes on the Del Mar turf course. Though he was passed by Caribbean Pirate in the stretch, he held second place and earned a shot at graded stakes racing. On August 11, 1996, The Barking Shark made his first start in a graded stakes – the $132,850 La Jolla Handicap (Gr. IIIT) at Del Mar. At odds of 18-to-1, the plucky gelding again went straight to the lead when the gates opened, and he led almost every step of the 1 1/16-mile race. Just at the wire, he was overtaken by a neck by Ambivalent. Suddenly, the horse with humble beginnings was a graded stakes-placed runner with a very bright future. On September 2, The Barking Shark took another step up the ladder to contest the $300,000 Del Mar Invitational Derby (Gr. IIT). In a change of pace, he did not fly straight to the lead. Instead, he tracked the leader in second place before taking over at the eighth-pole of the 1 1/8-mile race. Under Hall of Fame jockey Patrick Valenzuela, The Barking Shark stretched out over the firm turf course reaching for the wire. And much like in the La Jolla, he just barely fell short of victory – crossing the wire a head behind multiple Grade Two-winner Rainbow Blues. Off the strength of that effort, The Barking Shark’s connections decided to ship him across the country to chase the $750,000 purse and Grade One status of the Isle of Capri Casino Super Derby (Gr. I) at Louisiana Downs. It was not exactly an easy task, either, as the field included Belmont Stakes (Gr. I) winner Editor’s Note, Arkansas Derby (Gr. II) winner Zarb’s Magic, Alabama Derby (Gr. III) winner Vivace, Pennsylvania Derby (Gr. III) winner Devil’s Honor, eventual Travers Stakes (Gr. I) and Whitney Stakes (Gr. I) winner Will’s Way, and multiple graded stakes-placed stakes winner Clash By Night. Back on dirt for the first time in several starts, The Barking Shark was fourth early in the Super Derby, eventually working his way to second before grabbing the lead. In his first Grade One race, The Barking Shark was doing the unthinkable at odds of 25-to-1 – he was leading the classy field down the lane of the 1 1/4-mile race, with the Belmont Stakes winner Editor’s Note all out trying to catch him. It was a magnificent effort, but not quite enough to withstand the classic winner. In the end, Editor’s Note caught The Barking Shark and drew away for a convincing 1 1/2-length triumph. The second-place finish earned $150,000. Though he started three more times in 1996 after returning to California from Louisiana, it was clear the long, hard campaign had taken a toll on The Barking Shark. He was increasingly less competitive in each of those starts, after which he got a much-needed break from competition. The Barking Shark resurfaced on February 2, 1997 refreshed and ready to tackle his four-year-old season. Again dismissed at 22-to-1 in the $500,000 Strub Stakes (Gr. I) at Santa Anita, he shot to the lead and held it over another classy field as they turned into the stretch. Much like his other best races, though, the wire did not come quite soon enough for The Barking Shark. Dwyer Stakes (Gr. II), Swaps Stakes (Gr. II), and Lazaro S. Barrera Handicap (Gr. III) winner Victory Speech overtook The Barking Shark in the stretch and drew away for a two-length triumph over the gutsy gelding. Left in The Barking Shark’s wake was a field that included $1.6-million earner and classic winner Editor’s Note and multiple graded stakes winner and later noted sire Northern Afleet. The Barking Shark remained a fixture on the Southern California stakes circuit through the middle of 1999, but he was never quite able to match his success of the fall of 1997. He did flirt with his old form when he finished a closed second, beaten a neck by Musafi, in the $200,000 Bay Meadows Breeders’ Cup Sprint in September of 1998. Eventually, The Barking Shark began to drop back into the claiming ranks, and slowly down those ranks. By October of 2000, he was running for tags under $15,000 with no takers despite several good performances and a few wins. On January 20, 2001, The Barking Shark finished a dismal tenth, beaten 18 3/4 lengths, in a low-level claiming race at Bay Meadows. After fracturing a cannon bone – which required eight screws to repair – he was away from the races for over 1 1/2 years. By this time, he was being trained by Armando Lage. The Barking Shark returned to the races finally on October 13, 2002. Showing glimmers of his old self, the game gelding raced two the lead in a six-furlong claiming race and held the lead until late in the stretch, eventually finishing second. He was claimed from 5C Racing Stable, LLC and Lage out of his next start, a fifth-place finish in another six-furlong race. Trainer Doug Pederson made the $6,250 claim for owner Robert D. Bone. By this point, several concerned horsemen and women had noticed the classy horse toiling in low level claiming races in Northern California. 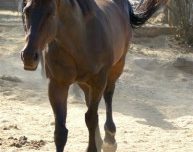 Some of them had previously purchased other horses in order to retire them, and they wanted to do the same for The Barking Shark. The Barking Shark gave Bone and Pederson two wins and a second in four starts. The last was a 2 1/2-length triumph in a 5 1/2-furlong claiming race at Golden Gate, where trainer Ed Moger, Jr. claimed him. Notably, he earned a 98 Beyer figure for that race, which proved to be his final start. Moger entered The Barking Shark into a claiming race set for Wednesday, March 12, 2003. He was scratched the day before, however, when a group of horsemen purchased him from Moger and officially retired him. Along with an anonymous donor, Teddy Cole, Letha Ehrenfelt, and Andy and Connie Pansini were also involved in the purchase. The Barking Shark retired a fan favorite with nine wins, 13 second, and 4 thirds from 56 starts (including 28 stakes races) and earning of $572,366. The impressive list of horses he defeated included graded stakes winners: Editor’s Note ($1,601,394, 1st Belmont Stakes (Gr. I), Super Derby (Gr. I), Kentucky Cup Juvenile (Gr. III)); Victory Speech ($1,289,020, 1st Strub Stakes (Gr. I), Dwyer Stakes (Gr. II), Swaps Stakes (Gr. II), Lazaro S. Barrera Handicap (Gr. III)): Vivace ($1,037,671, 1st Alabama Derby (Gr. III)); Will’s Way ($954,400, 1st Travers Stakes (Gr. I), Whitney Stakes (Gr. I)); Zarb’s Magic ($899,670, 1st Arkansas Derby (Gr. II)); Devil’s Honor ($810,166, 1st Pennsylvania Derby (Gr. III)); Old Topper ($655,861, 1st Best Pal Stakes (Gr. III), Pat O’Brien Handicap (Gr. III)); Northern Afleet ($626,670, 1st San Fernando Breeders’ Cup Stakes (Gr. II), San Carlos Handicap (Gr. II), San Diego Handicap (Gr. III)); Rainbow Blues ($602,535, 1st Del Mar Derby (Gr. IIT), San Gabriel Handicap (Gr. IIT); River Flyer ($573,276, 1st Hollywood Futurity (Gr. I), San Marcos Handicap (Gr. II), Tanforan Handicap (Gr. III)); Roar ($487,507, 1st Jim Beam Stakes (Gr. II), Swale Stakes (Gr. III)); and Matty G ($443,275, 1st Hollywood Futurity (Gr. I), Ascot Handicap (Gr. III)). Upon his retirement, The Barking Shark was sent to Glen Ellen Vocational Academy (GEVA), Northern California’s only non-profit equine retirement facility. GEVA is a labor of love for Pam Berg and her volunteers. Since Teddy Cole’s death, The Teddy Cole Foundation for Horses, Inc. has continued to make annual donations to GEVA and The Barking Shark. Letha Ehrenfelt continued to support GEVA and the care of The Barking Shark until her death, at which time she left a gift to GEVA. According to Berg, “Shark came here straight from the track on the day he was entered to race, so needless to say, he was on the muscle.” However, according to Berg, he was cooperative and posed well for the Channel 5 cameras that came to film his arrival. This writer once had the privilege of visiting The Barking Shark at GEVA. Just as Berg said, he was friendly and well-mannered – a pleasure to be around. He patiently cooperated as I took many pictures of and with him, and he could not have been much easier to handle. Over many years, I’ve seen a whole lot of great horses run – true champions and legendary performers. Few of those horses, however great, were able to capture my heart more than The Barking Shark. His sheer joy for running as fast and as far as he could was spectacular to watch. He was a perpetual underdog that continually outran his pedigree and many of the finest horses of his generation. He gave 100 percent every time because that is what heroes do, and that was the only thing he know how to do. The Barking Shark may not have been a champion, but he left a lasting mark on Pam Berg, myself, GEVA’s volunteers and donors, and many other racing fans who had the privilege of watching him run.